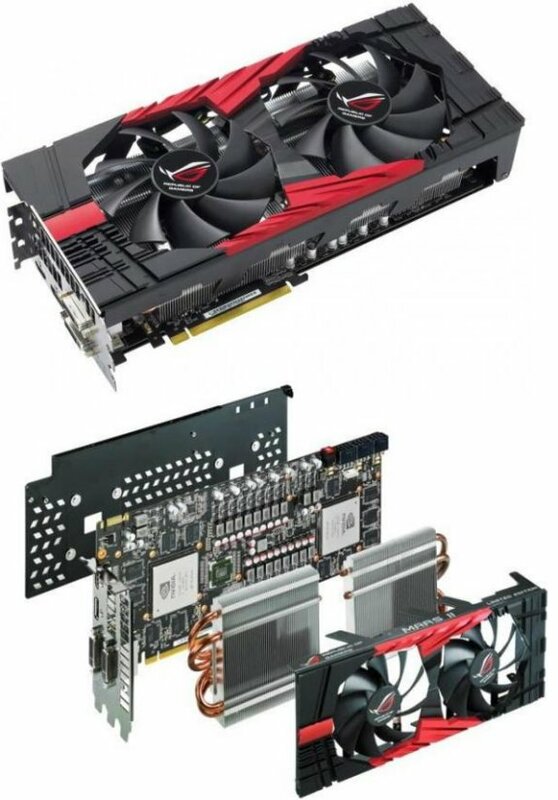 TC Mag received some press shots of the ASUS ROG Mars II, an exclusive dual-GTX 580 graphics card. Only 1,000 units will be made and they will be sold for around $1,000 each. First unveiled at Computex, the Mars II takes up three PCI slots and features an enlarged PCB, a dual-fan (triple-heatpipe) DirectCU cooler, a 20-phase power design (8+2 per each GPU/memory setup), Super Alloy components, three 8pin PCIe power connectors, two Proadlizer chips, and a button that keeps the fans working at 100%. Asus' creation has a GPU clock of 772 MHz, 1024 CUDA Cores @ 1544 MHz, a 2 x 384-bit memory interface, and a memory frequency of 4000 MHz, and four display outputs - two DVI, one HDMI and one DisplayPort.